I was about to give up when I saw an email entitled ‘How about some Yours Truly at Christmas?’ and I knew my day had just improved. The email was from my good friend Ken Stewart, letting me know that he was coming to town in December and was keen to make some music. 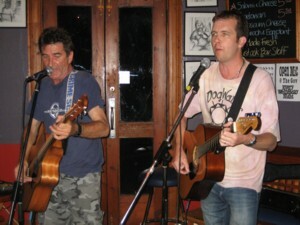 Ken is the mainstay of Sydney band Urban Guerillas and we enjoy an intermittent musical alliance of our own. Every year or two, when Ken travels across from his Sydney home, we perform as Yours Truly – making a racket and having a good time. Over the next week or so, Ken and I spoke on the ‘phone, discussing what we might like to do. We decided that we’d see what was going on in the week leading up to Christmas and try and play a couple of shows. I got to work, ringing venues and contacts; at the same time we started brushing up on each other’s songs. We sent mp3 files to each other and rehearsed in isolation; an interesting way of overcoming the tyranny of distance. SCALA was closed for a well-earned Christmas break, so I needed to cast my net a little wider than usual. I managed to secure us a gig at Sarah’s restaurant in the city, and also spoke with Corey about playing at the open mic at The Daniel O’Connell. Anthony at the Governor Hindmarsh was also happy to give us a spot on their Wednesday night session; the week started to shape up nicely. The icing on the cake was the chance to appear on Arts Breakfast on Radio Adelaide with Cath Kenneally, a great supporter of local and original music. Ken had done some work placing adverts in the press as well as ringing around so we hoped that the word was getting out. The first Yours Truly rehearsal took place on a hot mid-December Monday, 24 hours after Ken had arrived in town. I’d taken a day off work which meant we had plenty of time to get a set list organised. My doorbell rang mid-morning and, for the first time in three years, I welcomed Ken into my home. We started chatting immediately and stopped to draw a breath sometime around tea time that night. We had plenty to catch up on. When we weren’t talking, setting the world to rights, we were rehearsing. We needed at least twenty songs for Sarah’s, and soon came to the realisation that learning all the required parts in one day was a big ask. Instead we decided to rehearse five of each other’s songs (some we already knew), and do five songs each solo. We had a few others we could throw into the mix if needed. The rehearsal went well; by the end of the day we had over twenty songs that we were happy with. The set list had a nice flow to it, a good blend of duets and solo numbers; we were ready to rock. Ken gave me a couple of Guerillas t-shirts and we swapped our latest CDs. Early Christmas presents! We thought about going to the Monday night open mics but we were exhausted. On the Wednesday night we were aiming for an early spot at The Dan, followed by a performance at The Gov later in the evening. Ken came around to my place for a rehearsal of our ten ‘shared’ songs and they seemed to be coming together nicely. Good job too, as it was our last rehearsal. Ken and I went down to The Dan and put our names in the book. The venue was well attended, and I knew many of my fellow performers from SCALA. Ken and I started off the evening’s performance; we rattled off a couple of my songs, and it felt good to be playing together again. This Yours Truly thing works well sometimes! I played one of my solo songs to finish the first segment of our evening. After a quick break to have a beer or two, it was Ken’s turn. 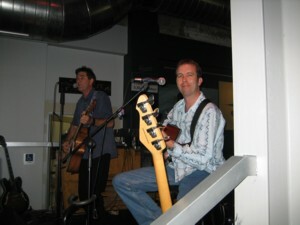 He played two solo songs before I joined him for a rousing rendition of “Fall to Pieces”, an Urban Guerillas classic and a Yours Truly staple. We left the stage and hung around for as long as we could before heading down the road to the Gov. We had a great time at The Dan, so much so that I have been back most weeks since. The Gov was another great experience. We didn’t get on until pretty late and, by that time, we were in a mood to party a little. We played a short set of six songs and, just for half an hour or so, I think we were the loudest acoustic two-piece on earth. We had a fantastic time and the crowd were very appreciative of our efforts. Ken broke a string during ‘Monday Bloody Monday’ which gave the song a strange, atonal quality in its latter parts. The Gov was a blast and we celebrated with a couple of beers to complete our night. On the Thursday we were scheduled to play at Sarah’s and it turned out to be a great night, despite all manner of complications arising. We were slightly unsure as to how we’d go at a restaurant, albeit a performance venue. Especially after our ear-shattering efforts of the previous night. How would we go in an unplugged-type setting? The gig had been booked in October and, as is my usual practice, I rang to confirm a few details on the morning of the show. I was directed to someone at the restaurant, where I left a message. By the time I left work that afternoon no reply had been received. I went home, changed and grabbed my guitar, and headed back to Sarah’s to get ready for the gig. We were expecting a biggish crowd; most of Ken’s family would be present, as well as a few of his mates and a bunch of my friends. When I got there, I was greeted by the members of another band, who explained that there had been a double booking and that they were scheduled to play at the same time as us. It took some diplomacy, an explanation that we had a fair crowd coming (and they had booked for dinner) and some common sense for all of us to come to an agreement. Yours Truly would go on, as scheduled, and the other band would follow. Credit must go to the band, Sleepless, for being fair-minded and very good about the whole thing. Next, we were asked by the management if we could play really quietly. We said we’d try but, as artists, we have to express ourselves… Taking the unplugged concept to new heights, we were then asked if we could we play without actually plugging in. Erm, no, not really. I thought we might be asked to remove our strings but thankfully that was the end of the discussion. As it turned out, the performance went really well. We did all of our songs, plus a few extras. 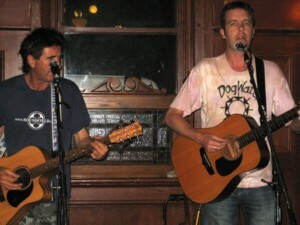 I played ‘Great Leap Forwards’, seeing as it was Billy Bragg’s 50th birthday that day. We rolled though our set with smiles on our faces; our friends and family had a great time, and the rest of the diners seemed to enjoy themselves. No-one left because the music was too loud. The food was good too! I left the city that night feeling very, very happy with the results of our escapades thus far. The next stop on our musical adventure was Radio Adelaide. Strangely enough, it was pouring with rain when I met a surprised and slightly wet Ken on Saturday morning. It had been such a hot week and the rain was unexpected, and very heavy. I pressed the buzzer on the front door and we were let in. During our spot Cath asked questions about what we’d been up to, and what lay ahead for us, collectively and as individuals. Ken spoke about the new Urban Guerillas CD, ‘… and the wind brought change’. I left a few DogWater CDs with Cath as giveaways. 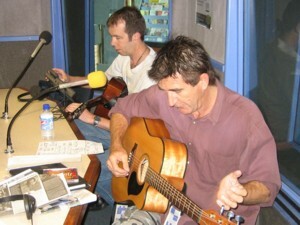 We also played a couple of songs live in the studio before bidding farewell to Arts Breakfast listeners and heading for a coffee. Just before Ken set sail for home, I invited him to come to Bad Ronald Studios (my place) and record one of his songs with me. ‘Love Makes Children’ is one of my favourite Ken songs, so I asked him to put down the guitar and vocal tracks of the song with a mind to adding my bits later. It took us a couple of takes, but we got the performance captured to our satisfaction. Now I just have to record my parts! And, with that, I waved goodbye to Ken, and Yours Truly, for (at least) another year. Off he drove, with a boot full of David Robinson CDs, as I waved goodbye, dressed in my new Urban Guerillas t-shirt. What a great way to spend a few days. We’d played together on Monday, Wednesday, Thursday and Saturday. The gigs had gone well, and I felt re-energised and inspired. What’s next?